Business formalities are a fact, no matter what form you operate under. Even the smallest and least formal business entity (Sole Proprietor or Partnership) has some formalities that must be adhered to. These range from additional IRS forms and filings to corporate record keeping. We compare the default forms of business to corporations and LLC’s in regards to the overall compliance and formalities of the business structure. 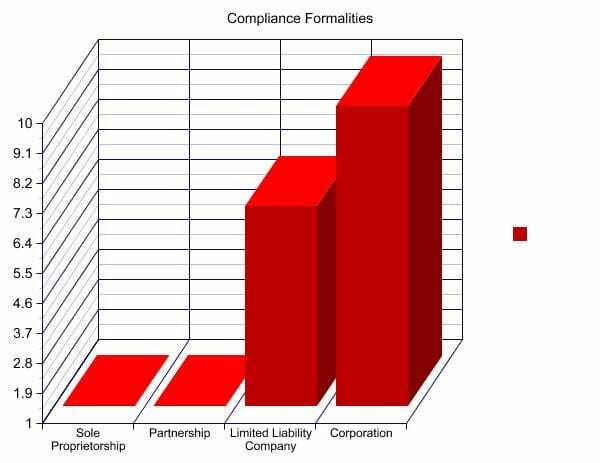 Starting out, we will immediately identify that the default forms of business are the least formal with the lowest amount of compliance items and operating formalities. This is also indicative of the benefits and protection afforded – very little compliance and formalities, very little protection and amount of benefits afforded. As the scale increases with the amount of maintenance involved of your business structure, the level of protection and amount of benefits does as well. Each business type will have IRS requirements. Projected tax payments, business tax reporting and itemized deduction reports are part of operating a business. Another form of compliance is business licenses and operating permits – regardless of any incorporated business type. Maintaining a registered agent is required by corporations and LLC’s that have been filed with your state’s office. Filing an annual report or statement of information is another annual item for corporations and LLC’s, required prior to the anniversary of the filing date of the business. Annual meetings and corporate record keeping is required for Corporations, a more traditional and formal entity type that offers some of the strongest protection benefits. Corporations tip the scales with their compliance requirements, being the only entity type that is required by federal law to hold meetings of the board of directors and shareholders, on at least, an annual basis. In this meetings, notes must be taken in the form of corporate minutes with actions and decisions approved in the form of corporate resolutions. The refreshing thing is that these formalities may only take a few moments per year. The format for these simple formalities are provided for you as part of the 1-800-COMPANY filing service. These documents are not filed or recorded with any government office, however are just as important if you ever need them in an IRS audit or lawsuit. Operating your business means that you have to perform administrative duties so that your business is recognized by the law, government bodies and possibly creditors or vendors. Operating your business in accordance with compliance needs is a part of being an entrepreneur / business owner. Some of these are no more than an additional form filed each year, while others are much more formal in nature that truly separate the business from its owners as a separate entity. Business Licenses and Permits: Every business owner should look into the requirements for operating and sales permits and business licenses. This largely depends on where your business operates and what kind of business it is. In some cases you will need a permit or license to sell a specific product, such as alcohol or tobacco. Self Employment IRS Reporting: Whenever there is business income and/or business deductions, you will report this to the IRS. Completing IRS form schedule C is how you report income or loss from a this business type. The schedule C form accompanies your personal return. Partnership IRS Reporting: Your state may require that you complete a “Partnership Return of Income” form with your personal tax return. This is an additional document that reports the income or loss from a partnership form of business that will identify your responsibility and tax liability, as one of the partners. IRS Forms: An LLC is a pass through tax entity, by default, where business losses and income for a single-member LLC will be reported on a Schedule C form with your personal returns. In multiple member LLC, by default, a form 1065 may be filed. If a form 8832 is completed and corporation status is elected, a form 1120 is filed. If, in addition, the 2553 is timely filed the form 1120S is utilized. Annual Report / Statement of Information: Each year prior to the anniversary of the incorporation date, a statement of information must be filed with the state of formation. This report simply documents the owner’s names and addresses and is accompanied by a nominal fee. Registered Agent: Every incorporated or formally registered business entity in this category will have to maintain a registered agent on public record. This is typically a person or company with a physical address to receive service of legal process. The name and address of the registered agent is available through public records. Therefore, many individuals elect to have an agency provide this service. Corporate Tax Reporting: Corporations are taxed as separate entities, the business will file an independent tax return, separate from those that own it. Annual Meetings and Minutes: Corporations are required, by federal law, to hold meetings of the board of directors and shareholders on, at least, an annual basis. In these meetings, officer decisions and actions taken on behalf of the business are documented in the form of meeting minutes. The decisions and actions are approved in the form of corporate resolutions. These documents are provided to 1-800-COMPANY clients.